Ugh, Kira too. In both her case and for Omegacron we should have put in a "normal" before movement. It is a good question whether or not Sonlen's Dragon Healing would be triggered by Cover Fire. I believe we can point to the precedent set by Saylind in all these cases. Since "placing" a figure is the same as "moving" (and Saylind actually uses the word "move"), anything that could be triggered by Cover Fire would already be triggered by Spear of Summoning (also Carry), with the possible exception of Trample Stomp. Interesting. I wonder if the FAQ for Kira Jax could be extended to those other powers? Excellent. We can defer the issue of Sonlen and Dund, then, since Saylind's FAQ is clear. As for Kira and Omega, I think ruling them the same way is the only logical way to do it. Their powers would not work. Pavin Nahz is interesting. I may be alone with this but Cover Shot SA is a theme fail for me if it allows Heroes to move that are not engaged with the target to move. Why would I be able to freely move 3 Heroes on the opposite side of the battlefield when I shot and miss? I understand being able to move a bunch of Heroes that are engaged with the target. Also if you changed it to only figures engaged with the target could move, then you would may not have to limit it to heroes only. Though then you might want to reduce the movement to 3 since the Granite Guardians would be included. Perhaps you could throw a clause on there about no other special powers being active for the figures moved. That might be a huge phrase, but there is room on the card. Just some things for you to consider. 3 s doesn't fail a unit for review, AV. 4 does thus . Pavin Nahz by Arch-Vile has received four votes (capsocrates, superfrog, nyys, and Super Bogue) for review and is removed from the process. Clearly Arch-Vile wants a hero that can help deploy hero figures. This makes the whole engagement option moot, since it would defeat the whole point of Favin. Allowing 3 heroes to move in the early game (since giving up an order marker Mid game would be very costly, and it is unlikely you would have many heros left endgame) would help groups like Death walkers, Cowboys, Ninjas, Elf Wizards, and the Vydar pod, and passive figures like aura boosters (Khosumet), Healers (Ana, Rhogar) and Snipers that can be used later (Deadeye, Syvarris). I think the idea that ANY heroes can move is a bit over powered, Perhaps a clear sight spaces limiter would be inorder. That said being able to move 3 of my heroes when my opponent is already within 10 spaces isn't much of a boon. If I have 3 heroes in my army already, I can think of much better things to do with an ordermarker at that point. I just realized you could use Pavin as a way to escape engagment, However how often does anyone retreat in heroscape and really what good would 4 spaces do, when your opponant is about to activate another ordermarker. Last edited by wriggz; June 27th, 2013 at 01:36 PM. Interestingly enough, a very similar discussion is going on in the book of Martian Manhunter in the C3G forum. I don't think Spear of Summoning is the correct precedent for Cover Shot. Cover Shot is a movement bonding power like Jandar's Dispatch, which allows powers like flying or Snow and Ice Enhanced Movement (or, presumably, Trample Stomp) to be used. That said, I think powers unrelated to movement that simply say "before moving" are referring to the sequencing of that power within the turn of that figure, and cannot be triggered when the figure isn't taking a turn. So I don't think Dragon Healing or Crippling Gaze or other powers like that get triggered. Interesting. How about "instead of moving" powers, like Omegacron's? That is my understanding as well. "Instead of moving" and "Before moving" and similar powers require it to be normal movement (i.e. as part of a turn--movement of the unit, by the unit--not as a partial activation by another unit). Heh. Every "instead of moving" power Hasbro released had the word "normally" tacked on the end. So I have no idea. Isn't Omegacron the best? In the interest of sanity, I think we should collectively agree that Omnicron Mobilization should be treated as if it says "instead of moving normally". 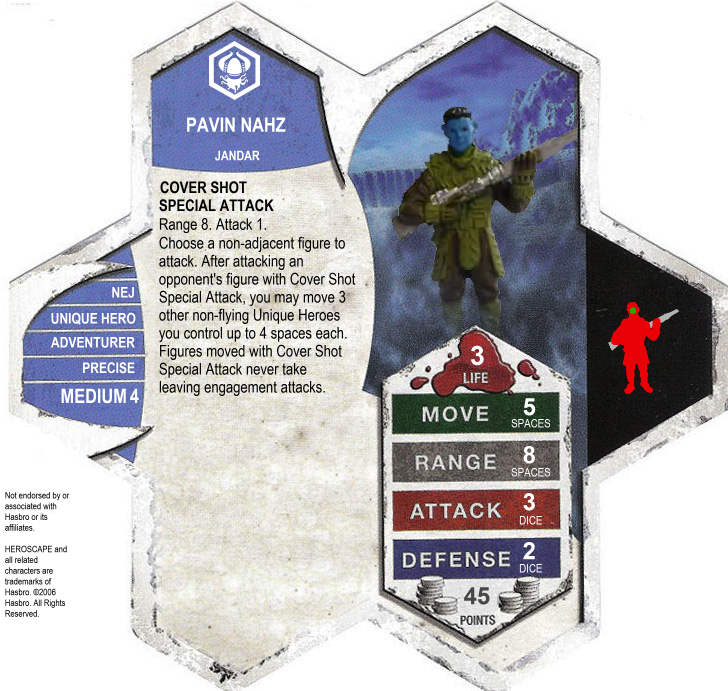 An interesting concept would be Pavin would allow 3 unique heroes to move that are within clear sight of the attacked figure. I really see theme there, for instance: a Krav Maga has Finn pinned down behind a ruin he can see his sword so he knows Finn is there. Finn wants to get to the next area of cover (a tree maybe). Pavin realizes this so he takes a random shot at the Krav making him duck which then allows Finn to make it to the tree while the Krav is distracted. However I think a cool addition (for theme and metagame reasons) to the power would be a stipulation that the attacked figure must have a ranged attack. This makes thematic sense because shooting at a knight holding a sword doesn't make much cover for your advancing army if they are under a hail of bullets. It also helps the metagame by making heroes more desirable (however slightly) and range less desirable (however slightly) as opposed to melee units. About the only thing that had any consistent consensus was Adrenaline Leap needing a height restriction. The other items were split to some degree. This was the closest vote that we have had on a SoV nomination in the Inner Sanctum. I hope that Son of Arathorn ponders these items and makes any changes that he feels best. Kar-Nu-Sa by Son of Arathorn did not pass unified fanscape evaluation and is removed from the process. He's not kidding about it being a close vote. With 100% participation (which is unusual) there was a difference of only one vote.